This fascinating exhibit includes a piece of the Allende, Chihuahua, Mexico carbonaceous chondrite meteorite, which fell to the Earth on Feb. 8, 1969. 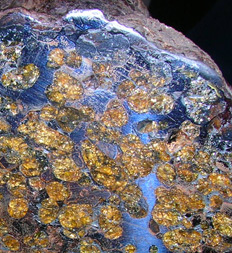 This is the most primitive type of meteorite known. Containing interstellar grains – stardust – it is believed to have formed during an explosion of a supernova/red giant star before the birth of the solar system, making it one of the oldest substances known to man.